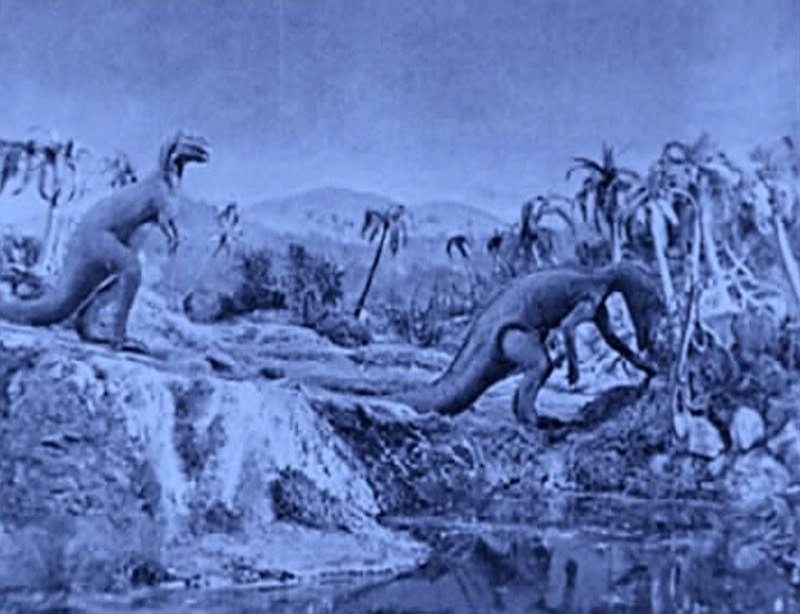 In 1929, a mere four years after the original theatrical release of The Lost World, the widow of one of the film's original financiers struck a bargain with First National to remove it from circulation and destroy all known prints. The theory is that that First National hoped to avoid overshadowing the release of the similarly themed new sound epic, King Kong, which would also feature visual effects by the one and only Willis O'Brien, ensuring that the silent Lost World would not be compared unfavorably with this new visual effects extravaganza. 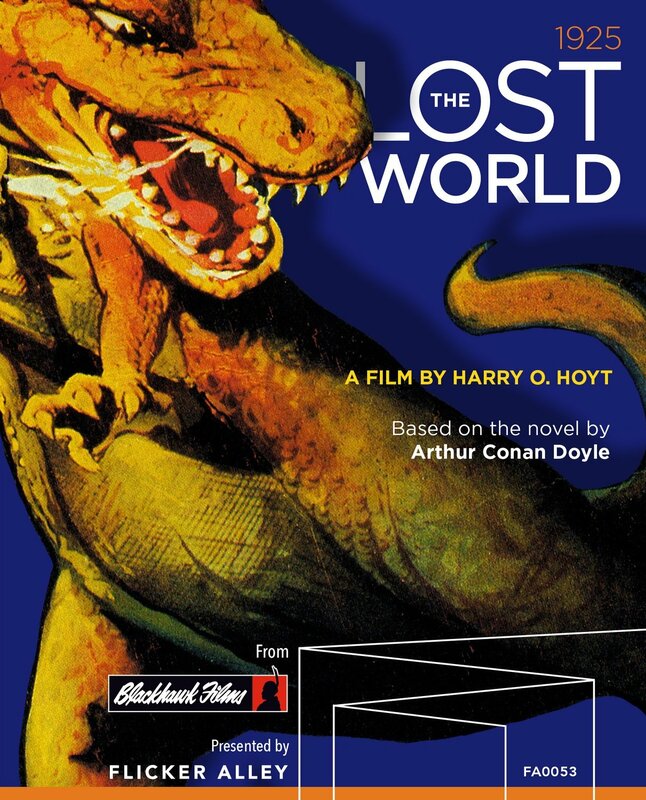 Thankfully, their efforts failed, and thanks to years of effort to piece together the disparate elements culled from various incomplete prints, we have a nearly complete restoration of The Lost World in all its glory. 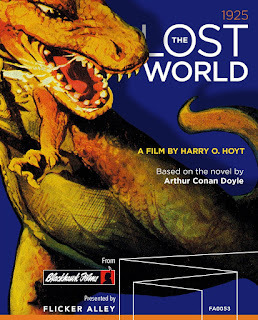 Based on the novel by Sir Arthur Conan Doyle (who makes an appearance at the beginning of the film), The Lost World is the story of a professor who puts together a ragtag team of adventurers to journey into the Amazon in order to prove to the world that the dinosaurs he claims to have seen truly exist. It's not among the finest of silent films, but it's undeniably fun, despite an uncomfortable blackface performance that will make modern audiences cringe. Yet what makes THE LOST WORLD so remarkable is its special effects. O'Brien's stop motion animation is every bit as stunning here as it would be in King Kong eight years later. Kong may be the better film, but Lost World paved the way for it. The film is a grand old-fashioned adventure and special effects showcase that makes a direct appeal to the young and the young at heart. It doesn't always hold up, and its pacing has a tendency to drag, but it's so visually impressive that it continues to endure today. It's hard to underestimate the influence of this film, as it continues to inspire modern films from Jurassic Park to Up. Flicker Alley's new Blu-Ray is a typically impressive affair, loaded with special features and featuring a striking new transfer. The most notable special features are two early short films by O'Brien, R.F.D. 10,000 B.C., and The Ghost of Slumber Mountain. O'Brien directed the stop-motion short film, R.F.D. 10,000 B.C., for Thomas Edison in 1917, about two cavemen who are competing for the same woman. and while it may be rather primitive even by 1917 standards (this was, after all, two years after The Birth of a Nation), what is most impressive about it is the animated figures. An early example of just how truly talent O'Brien was, R.F.D. 10,000 B.C. 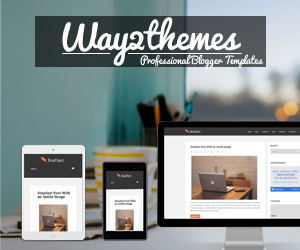 is an astonishing showcase for for his craft. The figures are incredibly fluid, even believable, outshining the otherwise roughly-hewn film. A much more cohesive showcase of Willis O'Brien's talents, this short film, coming merely a year after the much rougher R.F.D. 10,000 B.C., The Ghost of Slumber Mountain is a bit of a dry run for The Lost World. Framed as a story told by an uncle to his nephew, we are introduced by an explorer who is shown a lost world of dinosaurs by a mysterious ghost in an abandoned cabin. Feels like a tall tale that would be spun at bedtime to amuse children, The Ghost of Slumber Mountain is both outlandish and wildly entertaining. Its impressive stop motion presages O'Brien's triumph on The Lost World seven years later, yet stands on its own as a spirited and evocative adventure. Alfred Hitchcock's first American feature was also his only film to win the Oscar for Best Picture. It's no wonder either; working with uber-producer David O. Selznick, fresh off the success of 1939's Gone with the Wind, Hitchcock was given his most lavish budget and production resources of his career up to that point. The result is a fascinating hybrid of the two icons' styles, one that is neither fully Hitchcock or fully Selznick, yet still manages to bear the signature stamps of both. 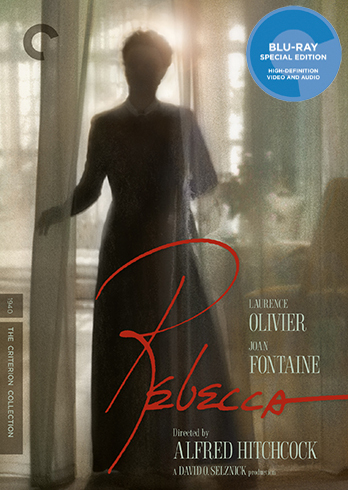 Rebecca, based on the novel by Daphne Du Maurier, features the sumptuous grandeur of a Selznick picture, and the macabre hallmarks of Hitchcock. Yet Hitchcock was famously exasperated by Selznick, and one can't quite escape the feeling that this wasn't quite the film Hitchcock wanted to make. Yet despite the thick layers of Selznick gloss, Rebecca is still a chilling Gothic romance, a ghost story with no ghosts, in which the never named Mrs. de Winter (Joan Fontaine) is haunted by the memory of her new husband's first wife, Rebecca. 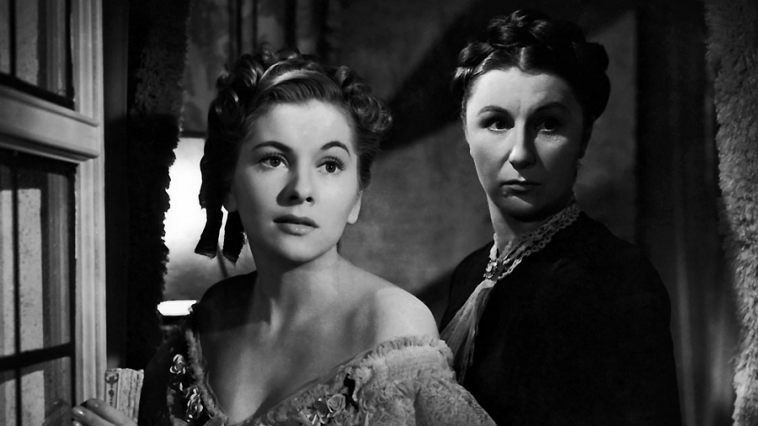 Joan Fontaine (left) and Judith Anderson (right) in Alfred Hitchcock's REBECCA. We never see Rebecca, not even in pictures or paintings, yet her spirit hangs over every frame, as the new Mrs. de Winter is constantly compared and contrasted with the woman who came before her. And no one is more disappointed by the new Mrs. de Winter than the mansion's grim head housekeeper, Mrs. Danvers (Judith Anderson), whose relationship with Rebecca clearly went much deeper than that of servant and master. 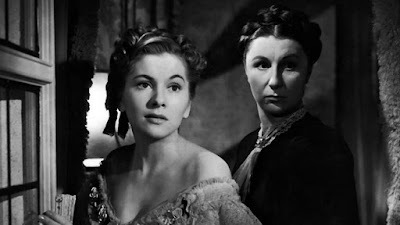 Hitchcock never shied away from homosexual themes (see Psycho and Rope for further examples), yet never is it more blatant than it is in the relationship between Mrs. Danvers and Rebecca. Much of Hitchcock's personality is woven into the subtext of the film - slathered in Selznick gloss on the outside, teeming with dark psychological character drama on the inside. It's like a horror film in which nothing frightening ever really happens - the horror here being a haunting memory of a domineering human whose influence manages to extend beyond the grave. It is telling that Hitchcock never tells us the new Mrs. de Winter's name - Rebecca is the only name that really matters, denying the new Mrs. de Winter an identity of her own until the bitter end. While Rebecca may not quite be top tier Hitchcock, it's impressive just how much of his personality he was able to infuse into the film in spite of Selznick's heavy hand. The sparkling wit of his British pictures is noticeably dialed back here, but it still manages to make some notable appearances. Hitchcock would go on to make better films in his ensuing decades working in America, but Rebecca remains an unusual gem in his career, a meeting of two cinematic titans who made a film that managed to feel like a product of both and neither of them at the same time. The new Criterion Blu-Ray is an improvement on the already excellent MGM disc from 2012, and has a much smoother quality, featuring more striking contrast in the black & white cinematography; not to mention an entire second disc of special features that make this a must-have for Hitchcock fans. Colorful musical adaptation of Mark Twain's classic tale, featuring toe-tapping numbers by the legendary Sherman Brothers and a score by the one and only John Williams. Presented by Reader's Digest, Tom Sawyer certainly has that sunny, all-American, and yes, abridged feeling of an issue of Reader's Digest; but there's also something undeniably charming and even innocent about its wistful view of a bygone era. While the songs may not be as memorable as the Shermans' best works (you likely won't be coming out humming the tunes like Mary Poppins or Chitty Chitty Bang Bang), but under the eye of director Don Taylor (Escape from the Planet of the Apes), Tom Sawyer has the sweep of grandeur of a musical in the classic Hollywood style, even if the songs don't always fit comfortably into the narrative. 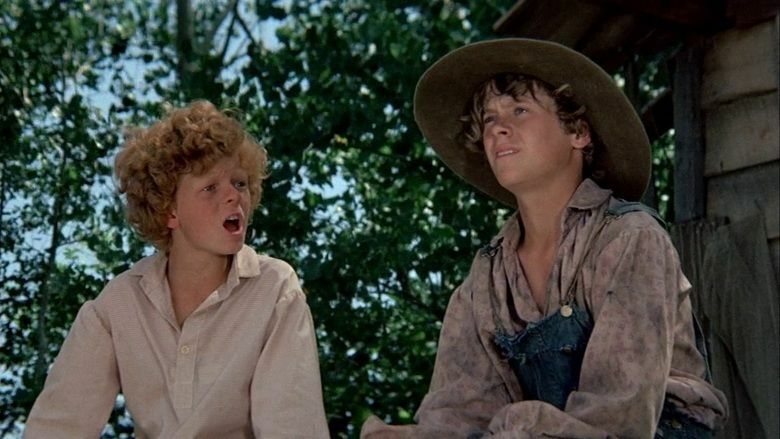 Johnny Whitaker (left) as Tom Sawyer and Jeff East (left) as Huckleberry Finn in TOM SAWYER. 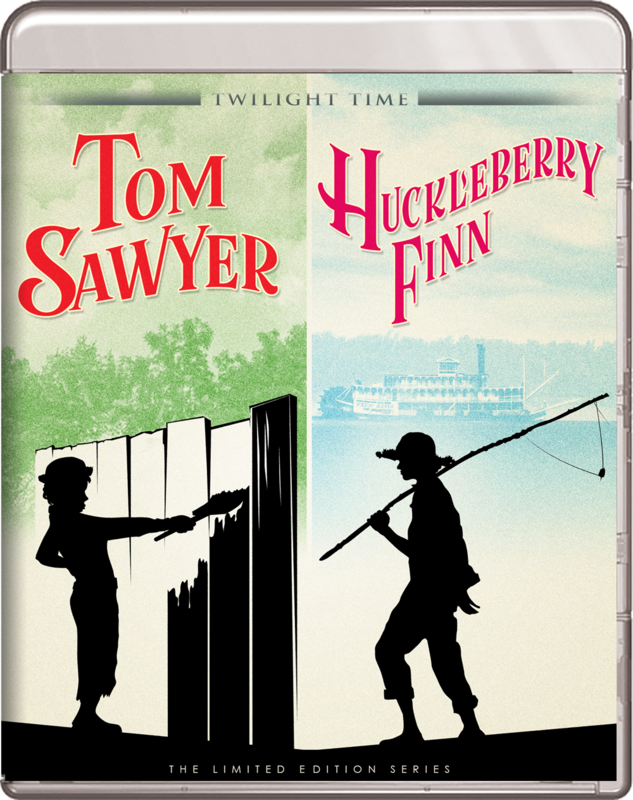 The direct sequel toTom Sawyer, Huckleberry Finn sees Jeff East reprise his role as the titular character, setting off on the Mississippi with runaway slave, Jim (Paul Winfield). By nature a darker story than Tom Sawyer, so its musical numbers seem even more shoe-horned into the narrative. Glosses over many of the book's racial themes in its quest to be a cheery musical, but the leads are strong (especially Winfield), and Harvey Korman and David Wayne inject some much needed energy in the film's second act as a pair of wily con men. The problem with this pair of Reader's Digest films is that they just don't lend themselves naturally to the musical format. The Sherman Brothers make a valiant effort, but the songs just don't stick, and often feel out of place. 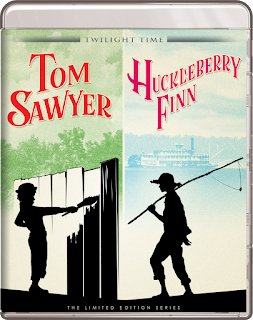 Tom Sawyer benefited from its all-American sunny disposition and happy-go-lucky lead (East can't quite carry this film like Johnny Whitaker did as Sawyer), but Huckleberry Finn feels like its just trying too hard to make this story happy, when its saddled with the weight of America's original sin. Come for Winfield's soulful performance and a spirited second act, but overall this adaptation of Huck Finn doesn't quite live up to Mark Twain's original work. This rarely seen gem of silent German cinema is at once a melodrama and a stunningly designed work of art that rivals many of its contemporaries in terms of sheer cinematic ingenuity. While not part of the German Expressionist movement that was going on around the same time, there are certainly elements of German Expressionist design present in Varieté, especially at the beginning. This sordid tale of a trapeze artist (the great Emil Jannings) who leaves his wife and child for a beautiful dancer (Lya de Putti) is a soap opera at heart, but director E.A. Dupont has a true artist's eye. His evocation of the pageantry of the circus, and the pulsing energy of the fair, is nothing short of dazzling. And thanks to the gripping performances of Jannings and de Putti, Varieté becomes something much more than its story suggests. As was typical for many films of its era, it turns into something of a morality play by the end, but Dupont imbues the proceedings with haunting sense of ambiguity. It's an almost operatic tale of personal tragedy, made great by Dupont's keen visual innovations and sense of character. On "Kingsman: The Golden Circle"